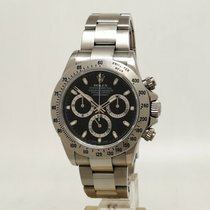 A pre-owned stainless steel 40mm case size stainless steel chronometer rated automatic movement Rolex Daytona model reference 116520 featuring a white baton dial housing silver rimmed white sub-dials surrounded by a stainless steel tachymeter units per hour bezel on a stainless steel full retail length Rolex Oyster bracelet. 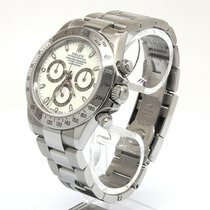 This particular watch has the benefit of a service completed by Rolex and includes the service card dated May 2017. The latest Rolex clasp, engraved rehaut, it comes complete with its original box, one swing ticket and purchase document when bought from a recognised high street retailer in preowned Rolex watches.